The Wharton School is synonymous with finance. From modern portfolio theory to asset-pricing techniques, Wharton’s faculty have remained at the forefront of educating leaders in the financial-services industry. With business decisions driven increasingly by financials — and having a good grasp of finance — developing the finance leaders within your organizational ranks is a sound, strategic investment that will pay future dividends. 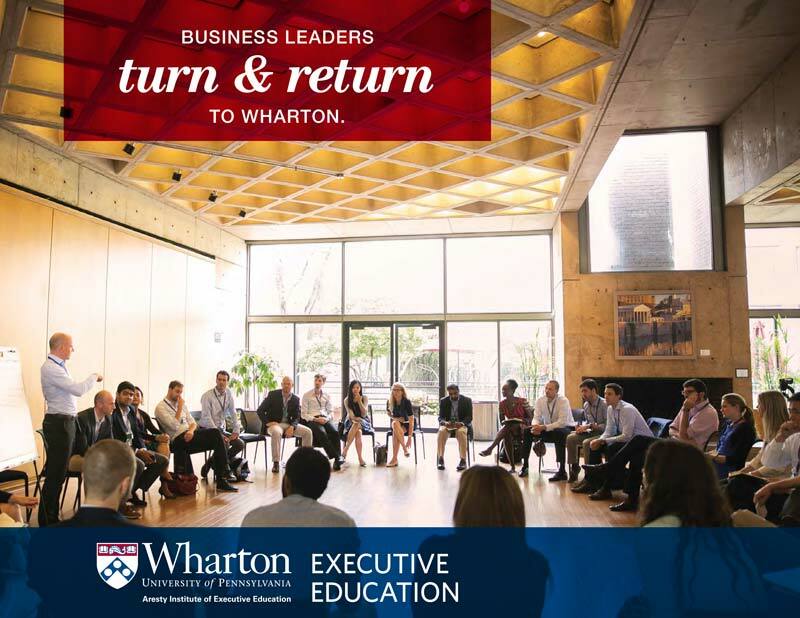 At Wharton Executive Education, we design and deliver programs that help financial and professional-services firms rise to today’s most pressing challenges, such as governmental/regulatory changes, mobile banking technology, new pricing models, and the growing shift from a product-driven approach to a more customer-centric focus. We understand how increased competitiveness in the financial sector, combined with more stringent regulatory-reserve requirements, has heightened global demand for developing employee capabilities. The Citi | Wharton Global Wealth Institute is a results-driven educational program that focuses on developing leadership and communication skills among the financial-services firm’s relationship-manager corps. The program is designed to help Citi’s highest-performing employees maximize their client relationships in the highly competitive private-wealth category. Over the course of a decade, two Wharton programs developed for FINRA have created a community of executive learners that has transformed the culture of this independent, not-for-profit organization authorized by Congress to protect America’s investors. Since 2008, 72 executives have graduated from the Wharton/FINRA programs and have been promoted, some earning multiple promotions.